Created by Lavinia Warner and Jill Hyem (also of Tenko fame), Wish Me Luck is a thoughtful and thrilling dramatisation of the ordeals endured by the brave civilian women recruited during World War II by the SOE (Special Operations Executive) – called ‘The Ouftit’ in Wish Me Luck – to operate as Allied agents behind enemy lines. The series which starred Kate Buffery, Suzanna Hamilton, Jane Asher, Julian Glover, Jeremy Northam, Warren Clarke, Lynn Farleigh, Jane Snowden, Michael J. Jackson and Catherine Schell, was very successful and regularly won over 14 million viewers. 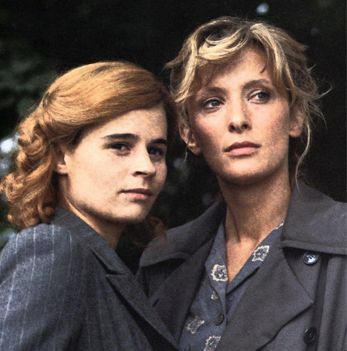 The first series, set in 1942, follows the experiences of wife and mother Liz Grainger (Kate Buffery) and plucky factory girl Mathilde ‘Matty’ Firman (Suzanna Hamilton) from their initial recruitment and training in England, through to the terrifying reality of their day-to-day lives as agents in Occupied France. Their fellow agents in ‘Area Three’ are Kit Vanston (Michael J. Jackson) and Colin Beale (Jeremy Northam). Running the show and having tough decisions back in England are Faith Ashley (Jane Asher) and Colonel James ‘Cad’ Cadogan (Julian Glover). Under their codenames, Celeste and Aimee, Liz and Matty are faced with the ever-present threat of discovery by the occupying German forces – who are led by the new Abwehr chief Colonel Krieger (Warren Clarke) – as well as the danger of betrayal by French collaborators. Other Cast: Claudine De Valois (Shelagh McLeod), Lois Mountjoy (Abigail McKern), Evelyn Woodville (Venetia Barrett), Laurence Grainger (Nigel Le Vailliant), Albert Firman (Arthur Whybrow), Aimee Firman (Marianne Borgo), Victor Travussini (John Challis) Felicity Hunter (Gabrielle Glaister). The second series begins in Autumn 1943, some months after Liz Grainger has returned from the field. Liz is now assisting Faith Ashley and Colonel Cadogan at the Londo n Headquarters of ‘The Outfit’, which, as always, is on the look-out for new recruits. 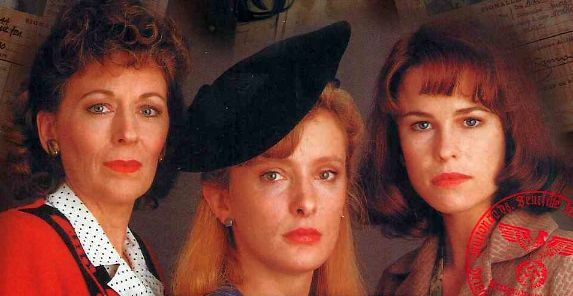 Despite some initial reservations about their suitability, both widow Vivien Ashton (Lynn Farleigh) and doctor’s daughter Emily Whitbread (Jane Snowden) pass the rigours of training and together with Liz’s former colleague, Colin Beale, are flown into South-Western France. Once there Vivien becomes ‘Solange’ and Emily ‘Zoe’. While Liz faces up to her failing marriage, and the return of Kit Vanston, in France, an informer and a dangerous secret threaten the lives of all the agents in Area 7. Other Cast: Gordon Stewart ‘Gaspard’ (Stuart McGugan), Josef (William Simons), Marie Ferrier (Gillian Raine), Leon Jouvet (John Boswall), Luc Ferrier (Mark Anstee), Annette (Carmel McSharry), Yvette Moreau (Trevyn McDowell), Sturmbannfuhrer Voller (Donald Gee), Jurgen Grunwald (Jasper Jacob), Laurence Grainger (Nigel Le Vailliant). The third and final series opens in May 1944 and sees the brave agents of ‘The Outfit’ inextricably involved in the fate of the Maquis-held Le Crest plateau in the foothills of the French Alps. Emily Whitbread arrives at the Le Crest plateau with a new friend Nicole Dissard (Felicity Montagu), and is soon reunited with her former lover Luc Ferrier and seasoned agent Kit Vanston. Kit is working closely with local resistance leader Jean Renard (Trevor Peacock) and living with a Jewish girl called Sylvie (Shirley Henderson). After sneding out two more agents to Le Crest – Lewis Lake (Jeremy Nicholas) and Virgina Mitchell (Catherine Schell) – Faith Ashley, now head of ‘the Outfit’, outlines to Kit and Renard her superiors’ plans for an uprising on the plateau. However, after the resistance forces mobilise, there is no sign of the promised support and General Stuckler (Terrence Hardiman) arranges an airborne invasion to quash the rebellion. Other Cast: Father Martin (Bryan Pringle), Philippe Bonnard (Glyn Grain), Gordon Stewart (Stuart McGugan), Colonel Max Dubois (Damien Thomas), Mrs Schneider (Fiona Walker), Jean-Louis (Jeremy Brudenell), Helene Rebard (Caroline John), Franz (Sidney Livingstone), General Liddiard (Jerome Willis). All three series of Wish Me Luck are available on DVD from Network. The original DD Home Entertainment releases are worth hunting down as each individual series boxset contains a detailed ‘making of’ booklet.